Welcome to part one of Paste’s five-part series digging in to Donald Trump’s Russian connection. I have already written a few articles about Russian meddling in American affairs, with one last October titled “Donald Trump is the Kremlin’s Man: A Comprehensive Case for Russian Influence in the GOP Campaign.” In it, I highlighted how not only were high-level advisors like Michael Flynn, Paul Manafort, and Roger Stone clearly connected to the Kremlin, but Trump’s rhetoric was straight out of Putin’s playbook. The title of that post and this series comes from what top security officials in the Baltic countries reportedly call our president: The Kremlin’s Man. This series will use articles from well-established sources like The New York Times, The Financial Times, Bloomberg, The Washington Post and many, many others to demonstrate a pattern of President Trump’s behavior that is sympathetic to Kremlin interests while simultaneously downplaying or outright lying about his involvement. There is no original reporting and there will be no “smoking gun” here. As history has shown us, unless a Nixonian-type tape comes out, there likely will not be a “smoking gun” on this issue. Undeniable proof is a difficult thing to ascertain. This series will not take on the certainty of a mass conspiracy that many Democratic operatives are currently engaging in—who have been writing their own John Grisham novels in order to avoid the unassailable fact that it was theirs and their candidate’s failure which handed the 2016 election to the most unqualified president in our nation’s history. Roughly 100,000 votes in a few states determined this election—enough for Russian meddling to swing it—but the fact that it was that close in the first place had nothing to do with the Kremlin and everything to do with the fact that Hillary Clinton promised more of the same neoliberal policies which have laid waste to middle classes across the Western world, all without providing much of a comprehensive solution for the millions of Americans currently stuck underneath the boot of crony capitalism. Instead, I will simply highlight a pattern of behavior that all points in one direction: that Donald Trump has a cozier-than-disclosed relationship with people close to Vladimir Putin, and the intelligence community’s assessment that the Russian government aided his election chances has merit based on independent sources, along with the fact that the Kremlin has supported political parties across Europe that they believe to be aligned with their interests. Now, I clearly think that Donald Trump’s camp engaged in some nefarious nonsense with high-level Russians, but I do not know this, and I will do my best to not pretend as if I do. I don’t think there was some intricate conspiracy by the Russians to develop their own Manchurian candidate over the years like many other proponents of this theory assert, as it is far more likely that they were simply opportunist dogs who finally caught the car they have been chasing for a century, and Donald Trump served as an ideal vehicle for this pursuit. This series will contain five parts. Tomorrow’s feature will focus on Trump’s extensive business dealings with Russian oligarchs with obvious connections to the Kremlin; Wednesday will investigate the disturbing number of high-level Russian officials who have been charged with treason or found dead since the election; Thursday will focus on the FISA court order which was allegedly aimed at people close to Trump before a much more narrow order aimed at two Russian banks was reportedly approved; and Friday will conclude with a unified theory as to how this all came together. In order to establish this pattern, we will start with something simple and unassailable for today’s feature: a timeline of Donald Trump’s statements and widely verified reporting on his relationship as it pertains to Russia. He now consistently denies that he ever had anything to do with Russia, as exemplified by this tweet from earlier this year. As his own actions and statements prove, this is demonstrably false. 1986 — Yuri Dubinin, Soviet Ambassador to UN, invited Trump to Moscow to discuss building a hotel to demonstrate the Soviet Union's budding internationalism. December 1988 — Trump set up a meeting with Mikhail Gorbachev, but the eighth and final leader of the Soviet Union nixed those plans at the last minute. July 1991 — Trump's Taj Mahal files for bankruptcy. March 1992 — Trump Castle files for bankruptcy. March 1992 — Trump Plaza and Casino files for bankruptcy. December 1992 — Trump Plaza Hotel in Midtown Manhattan files for bankruptcy. November 1996 — At a news conference in Moscow, Trump didn't think he had ever been “as impressed with the potential of a city as I have been with Moscow” and announced plans to invest $250 million in a number of projects that never materialized. 1997 — The Russian government donated a bronze statue of Christopher Columbus that is six feet taller than the Statue of Liberty. Built by Zurab Tsereteli—a close friend of the Moscow mayor at the time—Trump attempted to erect this statue on his development on the Hudson River, as he told The New Yorker “It's got forty million dollars' worth of bronze in it, and Zurab would like it to be at my West Side Yards development, and we are working toward that end.” After being unable to find any major U.S. city to take the statue, it now resides in Puerto Rico. November 2004 — Trump Hotels and Casinos Resorts files for bankruptcy. February 2009 — Trump Entertainment Resorts files for bankruptcy. Aras Agalarov is an Azerbaijani-Russian billionaire property developer, and a close Putin associate who was given the Order of the Honor of the Russian Federation. In 2014, Agalarov was also awarded the contract to build two stadiums for Russia's 2018 World Cup. He is the man standing to Donald Trump's left in the picture at the top of this story. I believe Putin will continue to re-build the Russian Empire. He has zero respect for Obama or the U.S.! Putin has shown the world what happens when America has weak leaders. Peace Through Strength! A few minutes before he made those remarks, Mr. Trump met at a VIP reception with Russia's ambassador to the U.S., Sergey Ivanovich Kislyak. Mr. Trump warmly greeted Mr. Kislyak and three other foreign ambassadors who came to the reception. Here is a picture of Kislyak (on the right) attending the speech, so at the very least, we can confirm that they both shared the same space on the day in question. He then followed it up with this bizarre exchange where George Stephanopoulos challenged him on the previous statements listed in this timeline. Trump: Well, I don't know what it means by having a relationship. I mean he was saying very good things about me, but I don't have a relationship with him. I didn't meet him. I haven't spent time with him. I didn't have dinner with him. I didn't go hiking with him. He also contradicted his assertion in the Republican debate seven months prior. Trump: We did 60 Minutes together—by the way—not together, together. When pressed about the change to a long-standing GOP platform towards Ukraine at the RNC, changing “lethal defensive weapons” to “appropriate assistance,” Trump attempted to run away from any responsibility to the alteration. Trump: I don't like Assad at all, but Assad is killing ISIS. Russia is killing ISIS and Iran is killing ISIS and they have lined up because of weak foreign policy. Raddatz: Mr. Trump, let me repeat the question. If you were president, what would you do about Syria and the humanitarian crisis in Aleppo, and I want to remind you what your running mate said. He said provocations by Russia need to be met with American strength and that if Russia continues to be involved in airstrikes along with the Syrian government forces of Assad, the United States of America should be prepared to use military force to strike the military targets of the Assad regime. Trump: Okay. He and I haven't spoken, and I disagree. It's true that Russia has bombed some elements of ISIS in Syria, but they have been far more focused on forces opposing the Assad regime, of which some are Western-backed. The Russians also dropped a cluster bomb on a UK outpost on June 16th of last year, so to portray them as pursuing American interests is at best, naive. As we have seen time and time again, that is patently untrue. Michael Flynn had to resign because he had something to do with Russia, and this non-denial to Yahoo’s Michael Isikoff is all the proof you should need to confirm that he was paid by the Kremlin for speaking at their propaganda network’s birthday party. 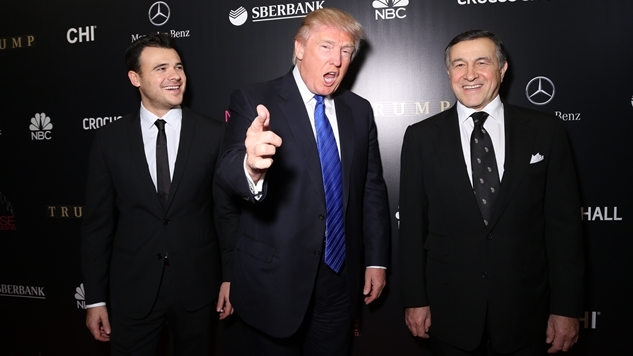 Felix Sater—who will figure prominently into tomorrow’s story about Trump’s businesses—is another person that Trump dealt with who very clearly does have ties to Russia. The same convenient forgetfulness that Trump has recently displayed on this topic is not only limited to his own dealings with Russia. August 2016 — Felix Sater told Politico that he was at Trump tower in July 2016 for a “confidential” meeting, and that he gave $5,520 in July to the campaign. Records even show a $120 refund by the Trump campaign to Sater for over-payment in order to comply with campaign finance laws. So Donald Trump claimed to not be familiar with Sater in 2015, despite the fact that two years prior to that, he felt familiar enough with him to rule out any mob ties for a twice-convicted felon who had been connected to four different crime families—including the Russian mob, and then Sater randomly shows up at Trump tower during the campaign and donates the maximum amount that he can. Forbes obtained e-mails and other documents proving communication between Donald Trump Jr. and Sater. There are plenty of other examples of Donald Trump clearly having something to do with Russia over the years, as he hired the law firm Sojuzpatent to file at least eight trademarks in Russia between 1996 and 2008. This commercial for Trump Vodka, which features the words “Russia is vodka,” Vladimir Lenin, and faux-Cyryllic text may be all the proof we need to demonstrate this patently untrue narrative Trump is now just recently trying to spin. DKAM | Trump Vodka – Russia from Overit Studios on Vimeo. Trump first mentioned Page’s name when asked to identify his “foreign policy team” during an interview with The Washington Post editorial team last March. Describing him then only as a “PhD,” Trump named Page as among five advisers “that we are dealing with.” But his precise role in the campaign remains unclear; Trump spokeswoman Hope Hicks last month called him an “informal foreign adviser” who “does not speak for Mr. Trump or the campaign.” Asked this week by Yahoo News, Trump campaign spokesman Jason Miller said Page “has no role” and added: “We are not aware of any of his activities, past or present.” Miller did not respond when asked why Trump had previously described Page as one of his advisers. None of this on its own is particularly damning. It sure looks like Trump just lies about Russia whenever it suits him. He was very clearly pursuing business interests in Russia in the late 2000’s, and especially in 2013 when he held his Miss Universe Pageant there, so his overtures to Putin could have simply been opportunistic fawning. He continued to boast about his relationship with Putin into the presidential campaign…up until it was reported that the Russians hacked the DNC. Donald Trump’s reported meeting with the Russian ambassador is above board, but his denial is what raises alarm bells. This is the pattern that everyone in his circle follows. They deny that meetings occurred, then when the reporting later comes out that they did in fact, take meetings, they walk it back all while asking “what’s the big deal?” Well, nothing had you told the truth from the start. Part two tomorrow: Trump’s business ties to Russian oligarchs.